In December 1928 she began her journey to India and continued to Darjeeling, at the base of the Himalayan Mountains, where she would continue her training towards her religious vows. Soon after, on January 6, 1929 she arrived in Calcutta, the capital of Bengal, India to teach at a school for girls. While in Calcutta, she was moved by the presence of the sick and dying on the city’s streets. She didn’t hesitate, she didn’t question. She asked permission to leave the Loreto congregation and to establish a new order of sisters. She received that permission from Pope Pius XII. 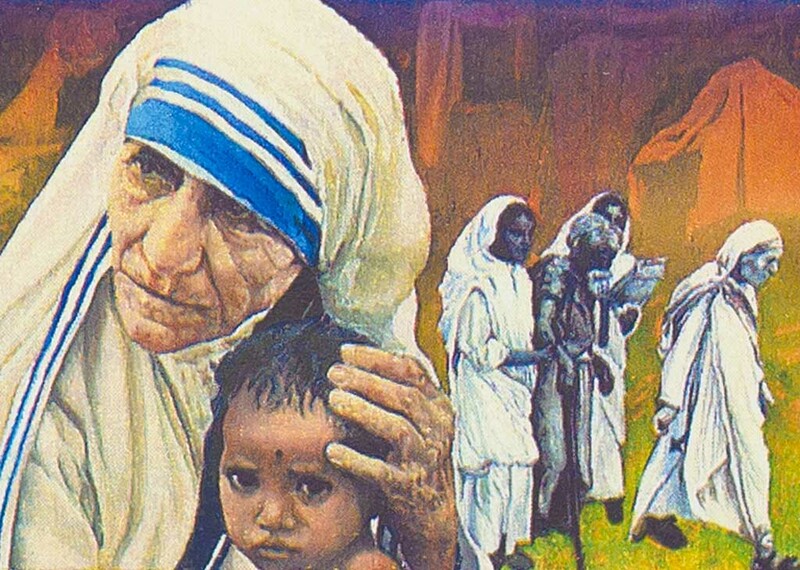 In 1952 Mother Teresa and her Missionaries of Charity began the work for which they have been noted ever since. Her order received permission from Calcutta officials to use a portion of the abandoned temple of Kali, the Hindu goddess of transition and destroyer of demons. Mother Teresa founded here the Kalighat Home for the Dying, which she named Nirmal Hriday (meaning “Pure Heart”). She and her fellow nuns gathered dying people off the streets of Calcutta and brought them to this home to care for them during the days before they died. Mother Teresa’s first orphanage was started in 1953, while in 1957 she and her Missionaries of Charity began working with lepers. In the years following, her homes (she called them “tabernacles”) have been established in hundreds of locations in the world.